In Teach to One, every day students receive a customized schedule matching them with the specific skill they are ready to learn, the best learning modality for that student and skill, the best location in the learning center, a teacher, and fellow students ready to learn the same skill. This choreography requires a deep understanding of all the skills we believe students should learn. To inform these decisions (and others), we created a skill map that provides the foundation for Teach to One. 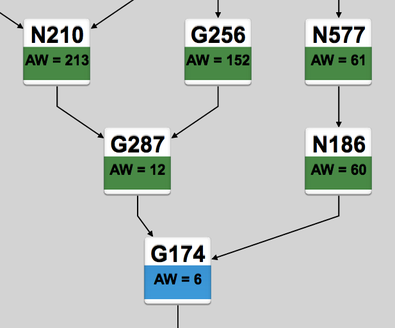 Our current skill map grew out of the earliest School of One pilot scope and sequence developed in 2009. In this post, we’ll cover some of the characteristics of our skill map and discuss some of the things we learned from the School of One pilot. In future posts, we plan to discuss in detail how our current skill map enables us to integrate skills into cohesive learning playlists built around problems set in real-world contexts. What is a Skill Map? We define the skill map as the universe of skills available for students to learn and the relationship among those skills to one another. It is not the learning progression (which defines the potential paths that students can navigate through the map), nor does it define whether or not students have choice in navigating from one skill to another, or even which skills students see at all. It’s the overall street map, not the route taken. While a state or Common Core standard might require students to “add, subtract, multiply, and divide fractions,” the skill map breaks these into discrete skills. In other cases, it may make more sense to combine multiple standards into one skill. 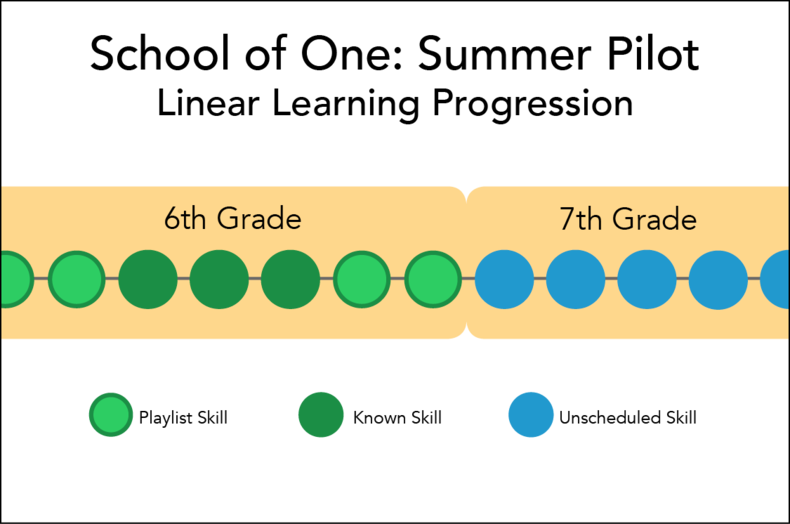 The goal is to define the grain size of each skill so that a student could learn it in a single lesson, allowing for the flexibility for students to move at their own pace through the skills in the skill map. Before students are able to use pi to determine the circumference of a circle, they must first know how to multiply decimals and be familiar with the concept of perimeter. By articulating the prerequisite skills for each skill (effectively the potential streets) we create a series of pathways for students to proceed through mathematics skills, individually or grouped with other students. The skill map enables New Classrooms to determine the best pathway a student should take by considering the skills a student has already learned and what other students are also ready to learn a specific skill. This allows teachers to work with targeted groups of students, confident that everyone is equipped to learn the new skill. In the example with pi above, a student could be scheduled for either multiplying decimals or working with the perimeter of shapes first. We can make that decision in a way that takes into consideration these other factors. The skill map is a critical component in personalized learning, enabling educators to look at what students know and customize a learning plan that meets their individual needs and abilities. Using diagnostic assessments at the beginning of the school year, we can identify the skills on the skill map that a student needs to learn. The skill map that provides the foundation of the Teach to One model is the result of years of review and iteration. When we launched School of One as a summer school pilot in 2009, developing a scope and sequence was one of the first projects we chose to tackle. We opted for something simple, largely because the program was only five weeks long and our overall focus was testing whether personalized learning could be brought to life. We essentially selected roughly 50 skills (based on the New York State Standards) and determined the order in which students would learn them. Our first scope and sequence would be familiar to most educators and anyone who has picked up a math textbook in the last 50 years: skills were mapped horizontally, laid out by grade level. The scope and sequence served as the learning progression since students have only one way to progress—from skill 1 to 2, 2 to 3, and so on. The outline reflects the ‘scope and sequence’ of a particular grade level, making it the most efficient way for teachers trying to make sure they move through all grade-level content before mandatory tests at the end of the year. Of course in a traditional classroom, students progress through the scope and sequence together, regardless of their individual skill mastery. In math, this can be particularly challenging since a failure to master one concept can often preclude a student from being ready to master a more complex concept. With the pressures of covering all of the material on the state test a constant concern, teachers either work tirelessly to help students fill those gaps or simply move on, hoping that skill gaps of individual students will somehow get filled in the course of studying more advanced skills. The cumulative effect: thousands of students entering middle school 2 to 3 grade levels behind. Even over the course of our five-week pilot, students’ varied paces meant they spread out across multiple skills. This made it more difficult to leverage the talents of teachers since students didn’t cluster around common skill gaps. Because the scope and sequence was linear, when students got stuck on particular skills there was no alternative skills for them to attempt. The scope and sequence was focused exclusively on defining discrete skills that can be taught in a 30-minute period. This allows for individual learning sessions in which the student could demonstrate knowledge of those skills. What would come later was the development of ways in which students could connect those skills over time to develop their learning in deeper and more conceptual ways, and explore the beauty of math in real-world contexts. Over the course of the summer pilot, we also learned from teachers that many of our initial hypotheses about the relationships among the skills weren’t quite right. And we learned that skills themselves needed to be more clearly defined so that we could ensure that instruction, content, and assessment all focused on a common reference point. Our next iteration of School of One would require something more robust than the traditional scope and sequence, which not only included more skills, but also began to solve for some of these inherent challenges. One thing was completely clear: a linear scope and sequence would no longer suffice.